1. Open the tube of choice- I am using Michelle by FourXDesigns. Delete copyright layers, as well as all other layers except the green hair ones. 2. Open the WA "ZOMBIES" then duplicate the full tube (whole body) and right click and choose SCALE LAYER and scale the copy down to 200 x 607 and arrange behind the wordart. Click the invisible "eye" in the layers box next to the original full tube to make it invisible. When the copies are positioned how you like, right click in the layers box and merge down so all the copy layers of the tube are now just ONE layer. Click the Fuzzy Select tool (magic wand) and make sure WA layer is selected in layers box then click within every letter in the wordart, you probably will want to zoom in just to make sure you're getting the transparent area within the wordart, and not clicking on the black portion of the WA. Then when it's selected correctly, go to SELECT>INVERT and click on the copied tube layer in layers box to make it active and then go EDIT>CLEAR. Add a drop shadow to the WA layer- FILTERS>LIGHT&SHADOW>DROP SHADOW with levels at 0/0/5 I first used a red color, added noise to it by FILTERS>NOISE>RGB NOISE levels at 20/20/20/0 with correlated checked. Then I added a black drop shadow with same levels, no noise. 3. Scale the close up tube to 348 x 521 and place behind the WA by dragging it down in the layers box. Add drop shadow with levels at 3/3/6. 4. Drag and drop from the scrapkit into the canvas/tag ELEMENT85 (red frame) and scale to 245 x 343, duplicate, and position the copy of frame as shown in tag. Merge both frames together to make one layer, then add drop shadow same levels as step 3. 5. Drag and drop PAPER15 into the tag, right click ADD ALPHA CHANNEL, then use the Ellipse Select tool to make a circle where the right frame is, go to SELECT>INVERT and EDIT>CLEAR. Then duplicate PAPER15 layer and use the Flip tool to make the copy flip, arrange as shown in tag. Merge these two layers together. 6. Drag and drop ELEMENT64 from kit into tag and scale to 409 x 420, go to LAYER>TRANSFORM>ROTATE 90 degrees CLOCKWISE. Then move to right side of tag, duplicate, use flip tool and arrange copy on left side. Merge these two layers together. 7. Drag and drop ELEMENT55 and scale to 188 x 188, duplicate and arrange as shown, then merge these two layers. Duplicate and flip. Add drop shadow same as step 3 and 4, but also add another drop shadow at levels -3/3/6 as well. Merge all these layers in this step together. 9. Drag and drop PAPER3 and PAPER13- these two are going to be the masks. SO right click and ADD ALPHA CHANNEL. Then drag and drop DBV Mask 112 into the canvas. While the mask is selected in layers box, go to COLORS>INVERT then LAYER>TRANSPARENCY>COLOR TO ALPHA. It will make the mask transparent. Right click on the mask layer in layers box and choose ALPHA TO SELECTION then click on PAPER3 layer in layers box to make it active... go to SELECT>INVERT and EDIT>CLEAR. The paper is now the mask. I added noise with same settings as earlier to this layer. Repeat this same thing with DBV Mask 123 and PAPER13 but no noise. Instead duplicate the mask 3 times to make it less transparent. 10. 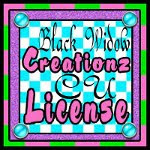 This is a great place to stop and crop your tag, SAVE it as .xcf and add your copyright info!!! What I do is add a white layer and place it at the bottom of the layers box so I can see edges better when I crop. Then I use the rectangle select tool and go to IMAGE>CROP TO SELECTION. Save as .xcf so you can always come in and make changes later. Add the copyright information- copyright symbol, artist's name, website, and your license number if applicable. After you're done with all this you can add the name to your tag. I am using a font called You Are Loved. After you type it, right click ALPHA TO SELECTION then SELECT>GROW by 2, add a new layer, fill with white and add a drop shadow. I also added the hand on top of it just to make it pop out more. Make sure you remove the white background before you save as a PNG!